For my regular readers I wanted to let you know I am on a long weekend off spending time with the family. Watch soon for more postings on history, current events, and other. Appreciate your support. Well fellow bloggers and writers here as requested are some interesting or not so interesting things about me. Thanks to all who take the time to read and especially those who like it enough to return. I certainly enjoy reading yours. A-Attached or Single? Married to the love of my life. B-Best Friend? My wife Cindy – absolutely and without a doubt. C-Cake or Pie? This is a hard one. Guess I would have to say pie. All kinds except for raisin. Favorites include lemon merangue and apple. D-Day of Choice? Sunday. Seems to be the one day I can manage some down time. E-Essential Items? Laptop and library card. F-Favorite Color? Red. I am on my third red car. Love it when my wife wears red. G-Gummy Bears or Worms? Neither. I’ll leave these to my six-year old son who can’t seem to get enough of them at 7-Eleven. H-Hometown? None really. My family moved lots during my early years. Calgary, where I live now, is my adopted one. Been here longer than anywhere else – 26 years. I-Indulgence? Chocolate chip cookies with a couple of ice cold glasses of milk. It’s the little boy in me. J-January or July? Definitely July. Love the hot weather. K-Kids? I have five. Two grown daughters from a previous marriage. Three with the love of my life. Six-year old son and twin girls four-years. Wouldn’t trade them for anything. Sure they’re a lot of work, but extremely rewarding. L-Life Isn’t Complete Without? My loving wife Cindy and our kids. M-Marriage Date? July 10, 2000. Best day of my life. My real happiness started this day. N-Number of Siblings? Two. I have a younger brother and sister. Being the eldest was way too much pressure. O-Oranges or Applies? Oranges for the sweetness and juiciness. R-Reason to Smile? Hugs and kisses from my kids, and being in love with my wife. S-Superman or Wonderwoman? Wonderwoman. Based on the things my wife manages she is my Wonderwoman. T-Tag 5 People. Pass on this for now. Check the links on my site for those I visit the most. U-Used or New? Love used books. New is nice, but I’m cheap so like bargains. V-Vegetables? Love broccoli and corn, hate carrots. W-Worst Habit? I don’t listen well and I interrupt – I am working on this. X-Ray or Ultrasound? Like all men it would be fun to have X-ray vision. LOL. Y-Your Favorite Food? Steak on the barbeque. Nothing like it. Z-Zodiac Sign? Taurus with birthday in May. Boy I am stubborn, but very loyal. Problem is I’m also impulsive. One of my heroes of the 1960’s has died. I loved the irreverence of this man. I did get to see him in person once and he was just so hilarious. Many of the things he said sounded insane, but were actually true when you thought about them. 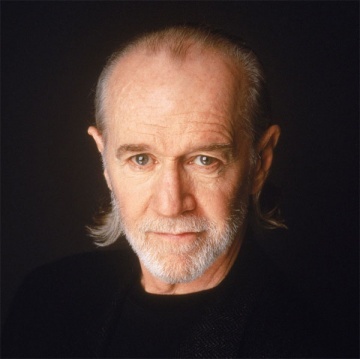 Here as a tribute are some of my favorite George Carlin sayings. – Electricity is just organized lightning. – Fighting for peace is like screwing for virginity. – I think people should be allowed to do anything they want. We haven’t tried that for a while. Maybe this time it’ll work. – I was thinking about how people seem to read the Bible a whole lot more as they get older; then it dawned on me – they’re cramming for their final exam. – Inside every cynical person, there is a disappointed idealist. – The other night I ate at a real nice family restaurant. Every table had an argument going. – Weather forecast for tonight: dark. – There are nights when the wolves are silent and only the moon howls. Driving across the northern great plains of the United States many of us have seen the many missile silos scattered across such states as Montana, North Dakota and South Dakota. It’s almost surreal to realize the weapons contained below ground at these sites are capable of ending civilization as we know it. Because of the end of Cold War, tensions between the world’s superpowers, Russia and the United States, are very low at the present time. Most of the missile sites have been deactivated under treaty agreements, the missiles removed, and their nuclear warheads destroyed or put into storage. However, there are still over 500 of these missiles deployed across the norther plain states today. The Minuteman missiles in these silos are the backbone of the United States Strategic Air Command’s nuclear deterance force. There is a new National Historic Site under the administration of the National Parks Service, Department of the Interior. 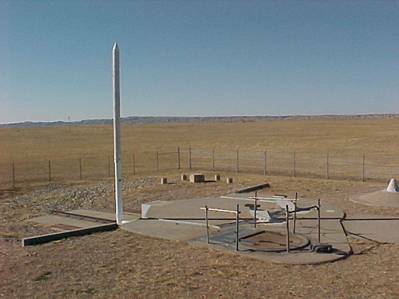 This is called “Minuteman Missile” and is located in South Dakota about 75 miles east of Rapid City along Interstate 90. It consists of an underground missile control center and a missile silo. I intend to try to visit it soon to add to my knowledge of the Cold War era. These missile sites are pretty inconspicuous. Not much is above ground, but they are heavily fenced with razor-wire and marked with ominous signs warning of the use of deadly force on trespassers. The military patrols the active sites and apparently there are movement sensors and cameras included in the site security. Stop and look if you want, but don’t approach the site or attempt to cross the fence. Can strike a target over 6,000 miles away in less than 30 minutes. Have a speed of over 15,000 miles per hour. They can cross the United States from east to west in less than 10 minutes, The same distance by car takes over 40 hours. The missiles are deadly accurate. Some say with 100 yards, although that is Classified. Remotely controlled from an underground control centre. Solid fueled rockets. This meant they were ready to launch immediately. No complex preparation was required as with liquid fueled rockets. 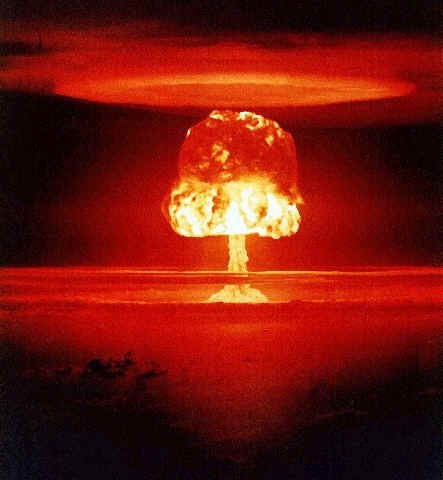 Armed with nuclear warheads about 10 times more powerful than the Hiroshima or Nagaski bombs. In fact they are “city killers”. 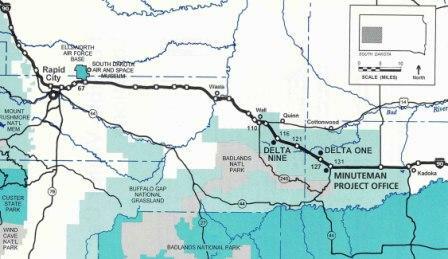 At the height of the Cold War the missile fields of South Dakota alone covered and area of over 13,500 square miles. This is an area larger than the state of Maryland. This site will be a sobering reminder of the Cold War and hopefully a warning to future generations of the potential to exterminate mankind. Up until now drivers on Interstate 90 have passed by without giving these installations a second thought. Now it is possible to get a chilling look behind the scenes. It will be a reality check for most of us. Remember the other side had and still has the same capability to destroy us. Attention Deficit Hyperactivity Disorder (ADHD) is a well-recognized childhood development disorder. It is characterized by inattention, hyperactivity and impulsiveness. These symptoms continue into adulthood for about 60% of children with ADHD. This means about 4% of the US adult population, or 8 million adults have the condition as adults. Few adults are ever identified or treated for adult ADHD. I am one who strongly believes he has ADHD. ADHD is not an adult-onset disorder. It must be verified from childhood memories or evidence to support the symptoms. School records for example can be most telling. For an old guy like me going back over childhood events and memories confirms that I very likely am ADHD. Growing up in the 1950’s and 1960’s this condition had not been identified and certainly not treated. Let me assure you that it does exist, although sometimes diagnosed incorrectly. It is very real. Any of these can be mild or severe and can vary with the situation or be present all the time. Many adults with ADHD can concentrate if what they are doing interests or excites them. Some adults look for stimulation, but others may avoid it. Adults with ADHD can be withdrawn and antisocial, or they can be overly social and can’t be alone. When I reviewed my past life history with the doctor to confirm that I had ADHD, these areas were considered and I found they fit me almost to a tee. Fortunately my mother saved all my old elementary and high school report cards. The consistency of comments is very revealing. “Intelligent, but requires more work”, “underachiever”, “fails to put forth the effort”, “lack of concentration”, or the most prevalent one, “can do much better”. Subjects I liked and found interesting I excelled at were history, geography and english. Math and sciences I found boring and had no concentration to apply to. There is no doubt in my mind I am an adult living with ADHD. I am in treatment, but more can be done for me and others. To convince a doctor or therapist you need to have the childhood evidence to relate to the adult. Impulsive behavior and anger are my two demons and I am working hard to drive them out or at the very least to be in total control of them. The people I love and the relationships I cherish deserve my full attention to this effort. What does Father’s Day mean to me? First let me explain my life situation. I’m 59 years of age and an older father. I have two daughters from a previous marriage both grown up now. The oldest one and her husband will be initiating me to the world of grand-parenting this October with the arrival of their son. I have three more children with the love-of-my-life. We have a six-year old son and twin daughters four-years of age. All my children are special to me. The love I get back more than makes up for the hard work involved in being a father. Being Dad is the hardest job I’ve ever had in my life, but also the most rewarding. No one is perfect and I have made my share of mistakes along the way. With the help of my loving wife, I have grown as a parent and managed to get better at the job. Of course there is always room for improvement. Life can be stressful and I need to learn to handle that stress better, but I am always working on it. My wife and children are asking what I want for Father’s Day. Sleeping in, having an unhurried morning coffee, watching a man-movie, and a nap on the couch are on my list, but likely not in the realm of possibility. Quality time with the kids come Sunday morning is the reality. In the final analysis I can’t think of anything of material value, but just for them to want me to be part of their life and let me love them. I highly recommend these types of sales to writers. There are a myriad of ideas just waiting to be gleaned from the books I purchased, plus factual references for my history articles. Sure the Internet is a wonderful place to get information, but there is nothing like paging through a book, yes a real book, finding interesting tidbits and enjoying reading at the same time. For nonfiction writers like me it is a must to read in the area you’re interested in. Not only do you find out things, but you see the style used by other writers. Best of all you can get some excellent books at fantastic prices. I estimate I obtained around $400 worth of books for about $40 between the two sales. My wife thinks I’m a little crazy, but at least she knows where I am – in my home office reading used history books. 1. Read the Table of Contents for key chapters I might want to concentrate on. An example here is the chapter in A Thousand Days on Kennedy’s time as president-elect from the general election in November 1960, until his inauguration on January 20, 1961. This to me is an interesting period in the successful candidate’s life. He knows he will president, but is not officially yet. Must be a frustrating time for many of them. Again more ideas for articles and blogs. 2. Scan the Endnotes and/or References at the back of the book. These usually give me other sources to look at and tell me where the author looked. 3. Scan the Index for key facts. For example in the Harry Truman book, I was interested on his daughter’s take on the assassination attempt of 1950. By searching the index, I found very quickly several pages related to it and more on some other threats the Secret Service had received. I was unaware of the latter. Now I have some ideas for future blogs or articles. 4. Take lots of notes. You are currently browsing the WRITINGS & RAMBLINGS blog archives for June, 2008.